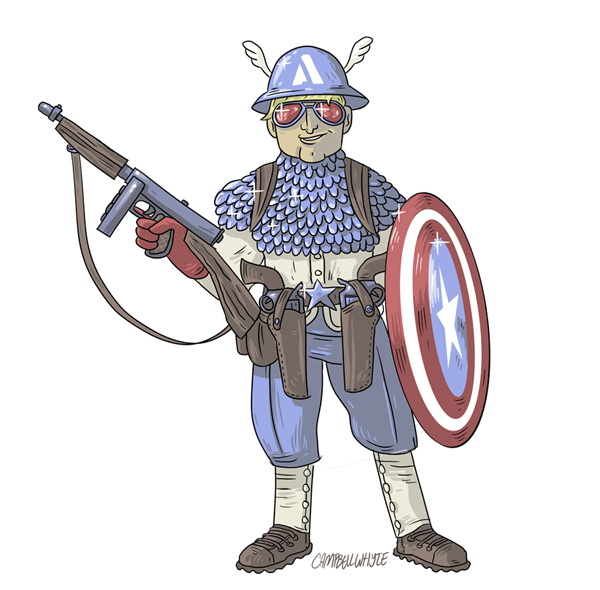 My redesign of Captain America. I’m a big fan of the scale mail on classic Cap, but as a whole, I think he’s a pretty awful costume design. I think those super patriot flag costumes always look really cheesy in the worst possible way. I tried to strike a balance between him being a superhero, and a soldier, with those elements kind of nestling amongst one another. He’s really a soldier first, who just happens to be super. They army dress him up a bit silly to boost morale and scare off the enemy. I imagine he’d be keen to use all of his familiar weapons from the war, although I imagine Tony Stark would give them a good seeings to, so they could actually contend with the challenges of the 21st century.